Tour Pacific Heights with its colorful painted ladies, famous mansions, and beautiful gardens. Visit the inside of a period Queen Anne Victorian. See where Ms. Doubtfire and Princess Diaries were filmed, or where Robin Williams and Francis Ford Coppola lived. The walk is easy and there are no hills to climb. Enjoy lunch after the tour on Union Street, our exclusive Victorian commercial district, or return directly back to Union Square arriving around 1:30pm. You'll be awestruck by the opulence of the Victorian mansions. Amazingly, many of these splendid estates are still single-family homes! 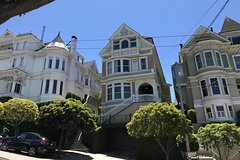 I have been living in San Francisco since the 70's, bought and restored my first Victorian home in the 80's, and have been studying and teaching San Francisco architecture since the 90's. After restoring a total of 3 Victorians to their former glory I can say that Victorians are true masterpieces of residential architecture. I have a great passion for our city's trademark architecture, Victorians, and am an active member of the The Victorian Alliance and The San Francisco Architectural Heritage. We'll meet on Union Square and take public transit to one of my favorite neighborhoods to see the best Victorian homes in the city. I restored a lovely Victorian in the 80's and will open my doors to give you access to the interior of a true "Queen Anne" Victorian. We'll take a leisurely walk through the neighborhood while I share the history of these intricate homes that have become famous TV and movie locations over the years. We will end in Cow Hollow on Union Street which has a distinct history of it's own built on the bed of old wooden ships. It's now lined with some of the best boutiques and restaurants in the city. Depending on your interests, I will recommend the best local gems to enjoy a leisurely brunch or drinks.